We work with the most underserved families in the metro area. Each conversation we have with our clients is an opportunity to educate them with a compassionate and nonjudgmental attitude. Sometimes general pet care isn’t widely known to all families we encounter. 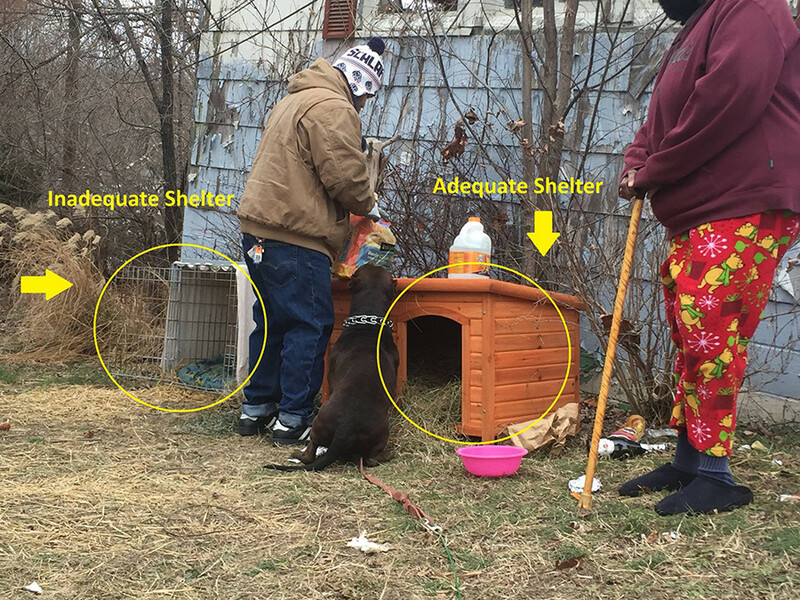 The simplest conversation about “adequate” versus “inadequate” shelter can lead to an enhanced quality of life for a pet in our community. All city ordinances have general pet care guidelines that help families understand the minimum requirements for caring for a pet. We know that the majority of our clients consider their pet to be family, so having a conversation about what their pet needs to have an improved quality of life is easy and welcomed. Adequate care means normal and prudent attention to the needs of an animal, including that care which is normally necessary to maintain good health in a specific species of animal. Grooming of animals is also required so that they are free from dangerous matting and nail overgrowth which can affect their health and may be painful. Adequate food means supplying at suitable intervals (not to exceed 24 hours) of a quantity of wholesome foodstuff, suitable for the animal species and age, and sufficient to maintain a reasonable level of nutrition in each animal. Adequate health care means the provision to each healthy animal of all immunizations and preventative care required to maintain good health, space adequate to allow the animal rest and exercise sufficient to maintain good health, and the provision to each sick, diseased or injured animal of necessary veterinary care or humane death. Adequate shelter means a structurally sound, properly ventilated, sanitary and weatherproof shelter suitable for the species, condition and age of the animal which provides access to shade from direct sunlight and regress from exposure to inclement weather conditions. Adequate water means a continual access to a supply of clean, fresh, potable water.